This chapter seeks to demonstrate the extreme complexity of trying to define sexual orientation, in general, and bisexuality, in particular. 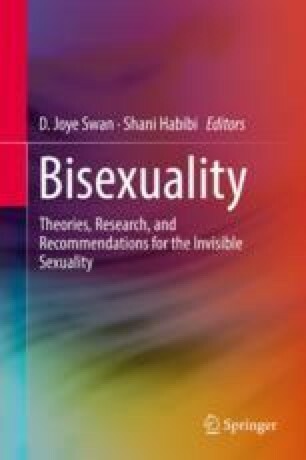 The key issues presented in the chapter include, (1) why a standard definition of bisexuality is necessary; (2) a discussion of who should define bisexuality; (3) the factors to consider when deciding what variables are to be included in a definition of bisexuality; and (4) a proposed new definition of bisexuality built on a synthesis of the chapter materials. First the chapter discusses the pitfalls of a lack of a standard definition of bisexuality and the growing consensus that research must attempt to find a common definition of bisexuality. Second, the reader is presented with three constituencies that may all vie for the “right” to define bisexuality: society, the self, and science. Third, the pros and cons of at least seven variables which have each been considered in varying definitions of bisexuality are weighed. Finally, the chapter concludes by providing a new definition of bisexuality with a few, final caveats and thoughts. Rosenthal, A. M., Sylva, D., Safron, A. & Bailey, J. M., (2011). Sexual arousal patterns of bisexual men revisited. Biological Psychology 88(1), 112–115. https://doi.org/10.1016/j.biopsycho.2011.06.015.